To recognize Greater Fort Lauderdale as the preferred warm-weather vacation and meeting destination with highly attractive visitor assets, a welcoming vibe and global interest. The Greater Fort Lauderdale Convention & Visitors Bureau (GFLCVB) is the official destination marketing organization (DMO) for Broward County promoting the warmth and beauty of Greater Fort Lauderdale. The GFLCVB drives economic growth and employment opportunities, by promoting travel and driving visitation to and within Broward County and Greater Fort Lauderdale. As the hospitality industry leader, the GFLCVB markets the area globally as a premier leisure, convention and business destination for the continual economic prosperity of the community, including all 31 of its municipalities. Click here to download 2019 Marketing Plan. Click here to download the 2019 Media Plan. 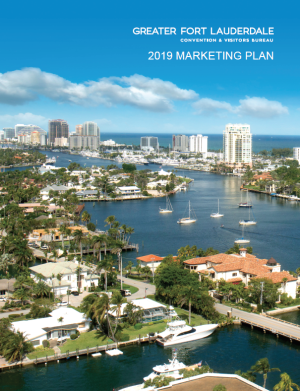 Click here to view the 2019 Marketing Plan Presentation Luncheon at the Broward County Convention Center on October 4, 2018.